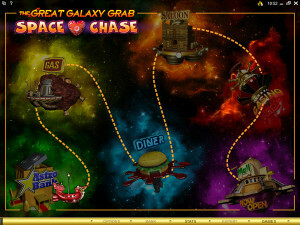 In The Great Galaxy Grab, players get their own chance at a Wild West land grab like scenario, only it takes place in space. The same characters that you would’ve seen in a western are placed in space now. We have a few colorful characters which are taking advantage of this opportunity, with the buildings of the space city being present in the form of different orbital stations. The game is interesting, both because of the unusual theme and because some very cool features are offered. 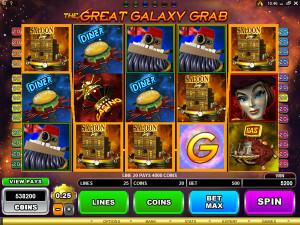 It’s one of the Microgaming slot machines. 5 reels are available here, with 25 bet lines being used on them. 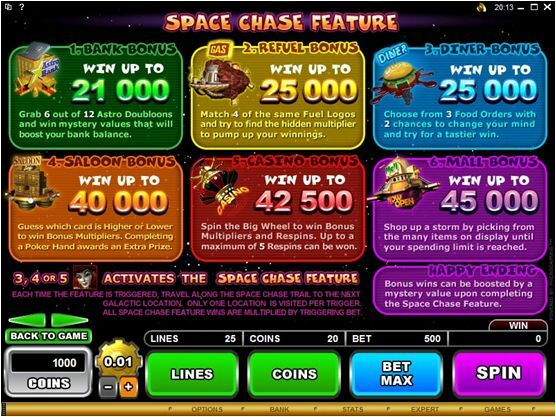 The Space Chase bonus is one interesting feature, along with the free games, the multipliers, scatters and wilds. $10,000 is the biggest prize offered. There are two special feature symbols in this case, one acting as both a scatter and a wild, while the other is a bonus game trigger and a scatter. 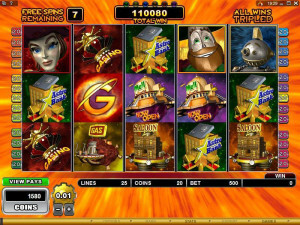 There are also free spins to take advantage of, multipliers and the bonus feature with its six levels. The G Logo will be used by the game in two roles, as both a wild symbol and scatter. While used as a wild, this symbol will reward you with 2x multipliers whenever it manages to help out with the formation of a new combo, so you always win twice the usual amount when it can get involved. It will not have any of its own prizes to offer. The same symbol is also chosen to act as a scatter, a trigger for the free spins when you have enough of them on the reels. 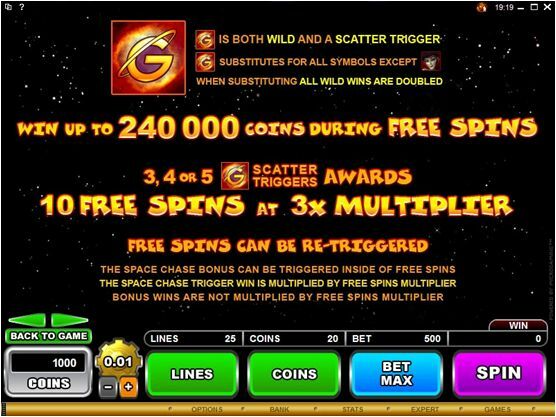 You need between three and five G Logos, and in exchange the game will give you 10 spins for free and a 3x multiplier for the prizes. 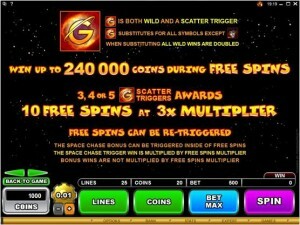 You can retrigger the free spins, with the same 3+ G Logos being sufficient for that to happen. 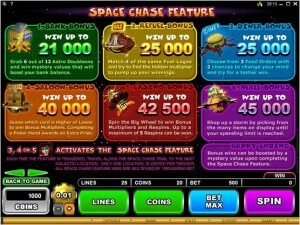 You can also start up the bonus game while in the free spins mode. 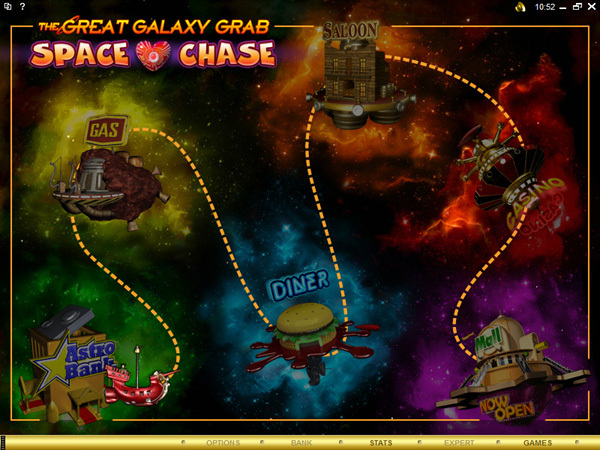 The bonus game is a very special part of The Great Galaxy Grab. It has six different levels for you to experience, and each time you trigger the feature you get a different bonus game out of it. You start off with Bank Bonus, then get Refuel Bonus, Diner Bonus, Saloon Bonus, Casino Bonus and Mall Bonus. 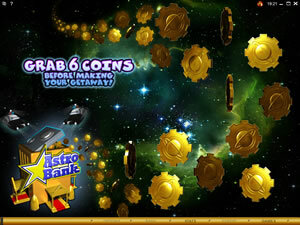 Bank Bonus offers prizes of up to 21,000 coins and you are asked to pick 6 of the 12 Astro Doubloons available, in order to win mystery prizes. Refuel Bonus is the second stage of the feature, with wins of 25,000 coins. The requirement is to match four identical Fuel Logos, while looking for a hidden multiplier which can make your wins a lot bigger. With Diner Bonus, the prizes are once again up to 25,000 coins. There are food orders displayed, and you can pick one to get the prize hidden inside. You also have two chances to switch to another order, before you’re obligated to stick with the last one. Saloon Bonus awards up to 40,000 coins and it asks you to guess what card will be lower or higher. If you also complete a poker hand in this feature, you gain an additional prize. Casino Bonus gives away up to 42,500 coins. You have to spin the Big Wheel, which will award you respins and bonus multipliers. The most respins you can win is 5. Finally, we have Mall Bonus, the last level of the feature, where you can win 45,000 coins. You are asked to shop until you reach your spending limit, so you keep picking items from the mall until that happens. As the bonus game’s last level is completed, you also get a chance to pick up some additional bonuses. Since the game has 25 lines, you have to use at least 1 coin on each one to activate them all. The game offers the option to select up to 20 if you want to though. The value of the coins is a bit low, only going up to $0.25, which means a line bet of $5 or less when all the coins are used. With 25 lines used, the wagers go up to $125. The big prize is a 2,000x multiplier offered by Captain Bronzebeard. While you get 40,000 coins out of it, their value is only $10,000. Since the action takes place in space, that’s exactly what you’re seeing in most of the symbols and in the background picture. The buildings which are part of this space city are all small space stations, so it’s an interesting look that I haven’t seen in other slot machines. The quality of the design is good, true both about the individual symbols and about the overall graphics. 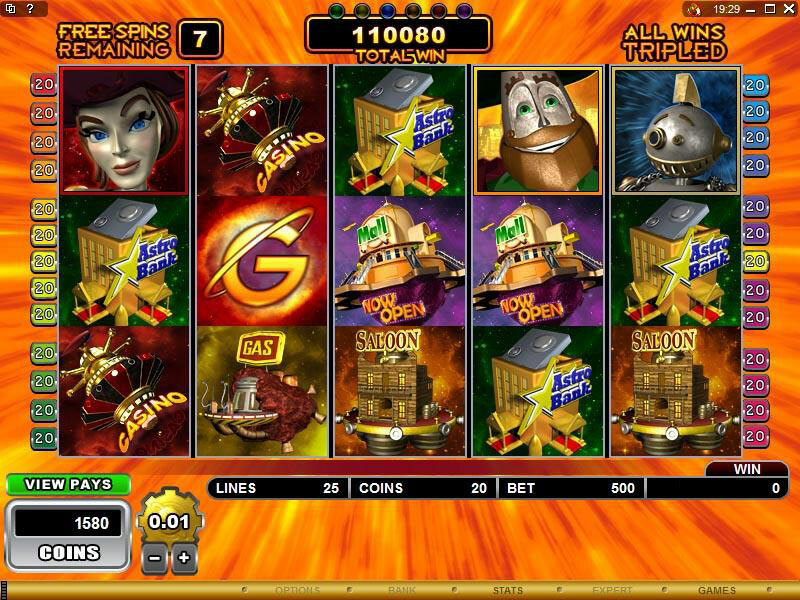 Symbols: G Logo (wild), Steel Scarlet (100x bet, scatter), Captain Bronzebeard (2,000x), Stella (1,500x), Deckhand Dan (1,000x), Rusty Robot (800x), Dozer (600x), Mall (150x), Casino (120x), Saloon (100x), Diner (80x), Gas Station (60x) and Bank (50x). It’s a unique game, mixing the Wild West with outer space. It does it very well, so it’s a game that you will enjoy if you give it a chance. 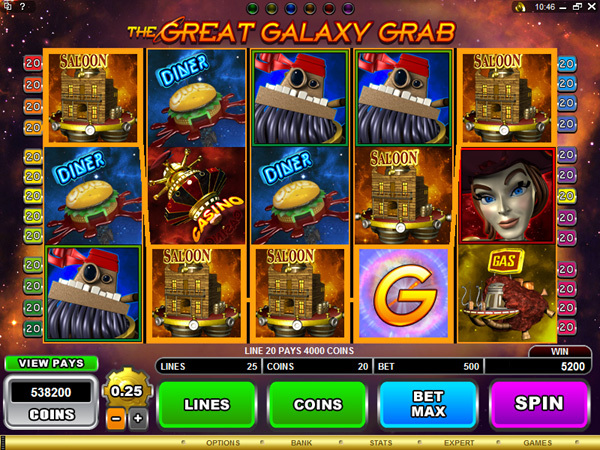 You will find The Great Galaxy Grab at any online casino which chooses to use software from Microgaming, playable either for free or for real money.